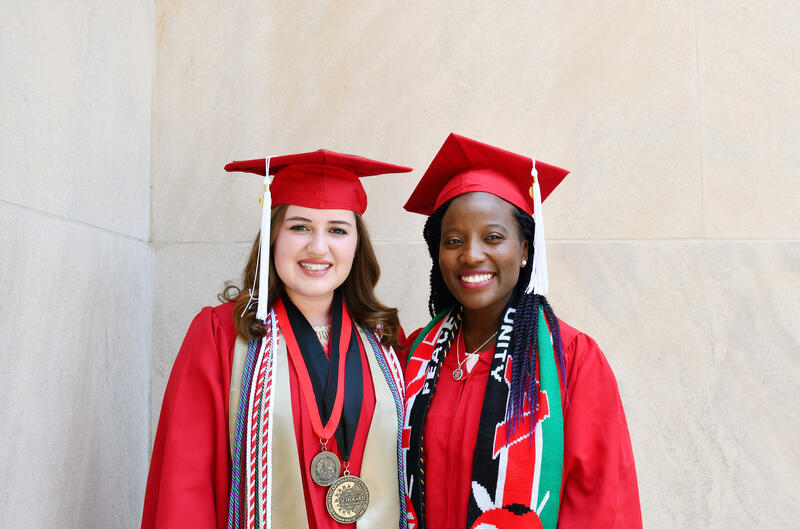 Cristina Chase Lane (left) and WinnieHope Mamboleo recently graduated from North Carolina State University's College of Education. You might think Mamboleo and Lane would be demoralized to be starting their careers at a time of such upheaval. But they say it's quite the opposite — they're galvanized. "Those frustrations have always been there," says Mamboleo. "But I feel like we're at a point now where teachers are like, 'We're going to try to do something about it.' And getting a voice past the classroom." "I think it's absolutely awesome," says Lane of the planned protest. "I know part of my philosophy of teaching is to teach students to have a voice ... and to be activists for what they want. And I feel like I can't teach them to do that if I don't do it myself. So watching all these educators come together for the common good is really great to see." In a recent NPR/Ipsos national poll, more than 9 in 10 teachers said they entered the profession because they wanted to do good. Lane and Mamboleo both express this same idealism. Lane says she has wanted to be an elementary school teacher since her own elementary school days, when she had a teacher who helped her overcome a learning disability. "That made me decide that I wanted to help someone in the same situation I was in," she says. Lane plans to teach third grade. Mamboleo comes from a family of teachers. She moved to the U.S. from Kenya while she was in high school. As she became more fluent in English, she excelled in math. "I just had really awesome math teachers who believed in me and also gave me a chance to stand up and speak to the other students," she says. "And that really gave me confidence." Mamboleo plans to be a high school math teacher. The two women are now preparing simultaneously for the long hours and high demands of teaching work and the modest income. Mamboleo has $20,000 in student loan debt. The oldest of four siblings, she is on her own financially. "I just have to be humble and know that the main difference I'm making is going to be in the class," she says. "I'm just not going to have a lavish life." "I'm not so nervous about next year per se," says Lane, "but long term, when I do have a family or when I start having to provide for other people." As a student teacher, she's already seen older colleagues who are married with children struggling to make ends meet. And yet Lane and Mamboleo remain committed to their purpose. "There's nothing better than seeing a student who just couldn't get it, all of a sudden has that 'aha' moment," Lane says. "There is no other profession where you get to see that." Jolie Myers and Kat Lonsdorf edited and produced this story for broadcast. In North Carolina this week, thousands of teachers are expected to march on the state Capitol demanding better teacher pay and more money for education. They're becoming part of a movement that started in West Virginia and has spread to half a dozen states around the country. I went down to the Raleigh area and spoke with a high school social studies teacher named Brent Belvin, who's been in the job for more than 20 years. BRENT BELVIN: I've advised some student teachers. I say, you better marry well or you better go to another state. You know, the future looks bleak. And that's I think why people are marching, just to help have a better future. SHAPIRO: Tomorrow we'll hear more from teachers and a lawmaker about the reason for these protests and how they fit into the national picture of teacher strikes and demonstrations. First I wanted to hear from some people who are just getting started in this profession, people who've just finished being student teachers. What does it mean to begin life as a public school teacher at this moment of walkouts and protests? CRISTINA CHASE LANE: I came to the College of Education four years ago in search of an education that would challenge me as well as help me grow into an outstanding teacher. SHAPIRO: That's Cristina Chase Lane speaking at her graduation from the North Carolina State University School of Education on Friday. Her grandparents were both educators in the state. She's wanted to be an elementary school teacher since she was in elementary school. She plans to start teaching third grade in the fall. Two days before her graduation, I sat down with her and another student, WinnieHope Mamboleo, who goes by Hope. Both say they were inspired to become educators by other teachers that they had. Hope came to the U.S. with her family from Kenya when she was in high school. Her mother had been a public school teacher in Africa. WINNIEHOPE MAMBOLEO: She was actually very worried for me. She goes, Hope, teaching is actually really hard. She's always been really supportive, but she just - she did - really did have that conversation with me where she was like, it's not as easy as it looks. I was like, I know student teaching is really hard, but I just want to do better tomorrow. SHAPIRO: Hope plans to teach high school math. North Carolina ranks 39th in spending per student and teacher pay. So I began by asking whether they expect to earn enough money to get by, starting with Cristina. LANE: I feel like I'm very fortunate because I'm still in a situation where I'm just providing for myself. So the salary we're going to get, I can support myself. But I also won't have any, like, school loans. So people in that situation are struggling. SHAPIRO: You're pointing to yourself, Hope. MAMBOLEO: Yeah. I've accumulated some loans, so a lot more budgeting coming up. SHAPIRO: I don't want to be too personal, but do you mind telling me how much student loan debt you're graduating with? MAMBOLEO: Yes. I have $20,000 in loans. And that's a lot for my family. MAMBOLEO: Truthfully, my parents don't even know how I got to senior year. They just know that graduation is happening. SHAPIRO: You've made your own way. MAMBOLEO: Yes. Yes. It's, like, so bittersweet. Like, I know I'm going into a difficult situation. But I know I'm going to have to balance my spreadsheets and (laughter) just kind of make it work. SHAPIRO: When you got into the classroom to do your student teaching, were there things about the classroom experience that surprised you, whether it was supplies not being there or other expectations you had that didn't turn out to be true? LANE: I think everything surprised me, truthfully. When that full-time six weeks hit me, I was like, oh, my goodness. Like, after school I was doing nothing except preparing for the next day and then getting to school, teaching, and then doing it all again that night. When we did anything crafty or whatnot, we had supplies in the classroom. But for instance, once I wanted my students to work on, like, a poster board, but I had to go purchase that because they weren't at my school. SHAPIRO: So you just shelled out cash out of your own pocket as a student teacher. SHAPIRO: How'd you feel about that? LANE: Truthfully, I didn't mind 'cause I was very excited about the lesson itself. LANE: I don't know how that's going to go next year (laughter) when I'm teaching more than just six weeks. But - yeah. SHAPIRO: Yeah. You both wanted to get into education because of experiences that you had with educators. Once you learned the reality of how much money you'll be making and how many hours you'll be working, did any part of you feel like, oh, I didn't know that that was what it meant to be a teacher? MAMBOLEO: For me, I think I looked at the bigger picture. There's a certain peace of mind that, like, once you're in a classroom, you've set your classroom norms with your students and you're building rapport and, like, there's that moment when students know like, wow, I can actually breathe and learn and be myself in this space. I need to focus on making a difference. And beyond that, it's hard. But it's always been hard. And it will continue being hard. So I just got to have tough skin. LANE: I think when it comes down to it, I really had to think about, like, what's my why? Like, why did I want to go into this profession? And I know for me, like, there's nothing better than seeing a student who just couldn't get it, couldn't get it, couldn't get it, and then all of a sudden, like, has that aha moment. And you're just like, that's why I'm here. Like, all the hours of planning the day before makes that moment worth it. SHAPIRO: So how do you both feel about these protests that are happening all over the country, including now in North Carolina? LANE: I think it's absolutely awesome. I know part of my philosophy of teaching is to teach students to have a voice and to voice your opinions and to be activists for what they want. And I can't teach them to do that if I don't do it myself. So watching all these future educators, like - or educators now go and protest and, you know, come together for a common good is really great to see. SHAPIRO: This is so interesting to me because I kind of assumed coming into this conversation that you might both look at the protests and think, oh, no, what am I getting into? This field where people are not paid enough and are not given the supplies they need. But instead what I'm hearing from both of you is it makes you more excited to get into this field to see people using their voices and making their needs known. MAMBOLEO: I grew up in a family that every day was another African proverb. MAMBOLEO: Yeah. There's one that says, it takes a village to raise a child. SHAPIRO: I've heard that one. MAMBOLEO: Another one I always heard is you have to lead by example. Like, I want to tell my students to make their voices heard, as Cristina said. But I also want to show them that, hey, I'm doing the same. So kind of, like, practicing what we preach. MAMBOLEO: Yeah. So I'm really super excited because it's actually happening (laughter). Yeah. LANE: I think it's also a great way to kind of unify everybody coming together. Before I think the problems with the - in the field of education, like, regarding financial things, for instance, has been kind of, like, hush-hush or, you know, table-talk conversation, not really out loud. And finally we have this chance to be heard. So I think it's a really great way to see the support that we all have. SHAPIRO: That's Cristina Chase Lane and WinnieHope Mamboleo, who graduated from North Carolina State University's School of Education last week. They're both planning to attend the statewide teacher demonstration in Raleigh on Wednesday. (SOUNDBITE OF HINT'S "SHOUT OF BLUE") Transcript provided by NPR, Copyright NPR.